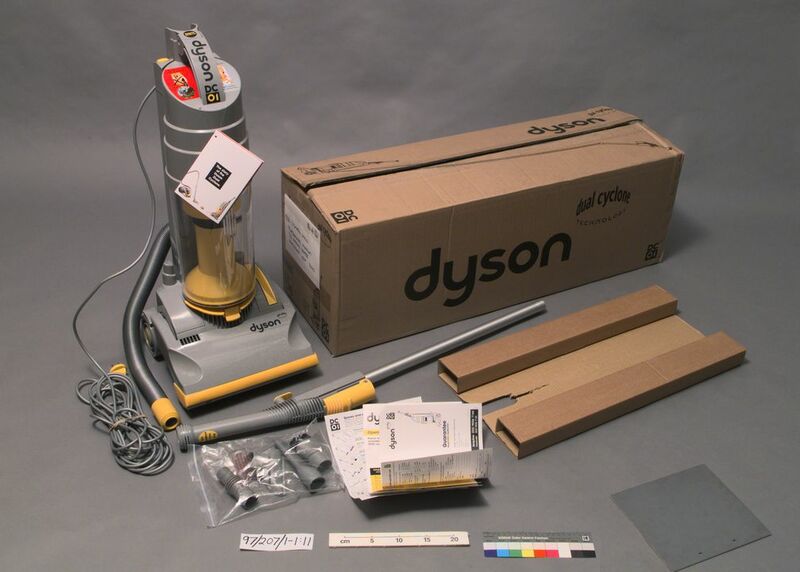 Made by Dyson, James in United Kingdom, 1996. (-1)Upright vacuum cleaner, with cyclone suction chamber and hose pipe. It stands on two large wheels with an air inlet at the front and two small balance wheels at the back. (-2)Handle, plastic hand grip attached to pipe, connected to the 'suction' chamber by a corrugated plastic hose, located on the frame by a plastic clip (it can be detached and extended to be used as a vacuum hose). (-3)Accessory, brush, circular head with black [nylon] bristle. (-4)Accessory, triangular head with two strips of red plush on the underside. (-5)Accessory, grey nozzle, cylinder flattened at one end. (-6)Accessory, hose adaptor, small cylinder with grooves. (-7)Guarantee card, printed in black on white card. (-8)Operating instructions, A4 sized booklet. (-9)Mail order form for new parts for vacuum cleaner (filters, belts etc.). (-10)Brown cardboard box with support inserts, cardboard, stapled. (-11)Plastic bag, resealable, packaging for accessories. (-3:5)Manufacturer's name moulded into plastic of accessories, 'DYSON'.